It’s not hard to see why Ouyang Jianghe considers Phoenix his magnum opus. The book-length poem, at once difficult and exciting, feels like somehow watching the brain and musculature of an in-motion animal. Juxtapositions, short narratives, and allusions to the Chinese literary tradition—these disparate parts are surprising with their motion. With this combination, Ouyang critiques the constant ad hoc of globalization, especially as it speeds China through demolition to buildup. “The forest is gone now; a cement world looms. / Flightless, we build homes in the sky, / adding brick and tile to the ecology of the birds.” Even one’s speech and writing require pieces from the other side of the world, Ouyang points out. Children speak English in Cantonese. the phoenix can’t be the only bird. to hold up an avalanche of empty space. In the Chinese, hold up (zhi) denotes support. However, the English hold up gives the line another read: delay. While the rebarred layers currently support an empty space, they only delay its eventual avalanching down, thus emphasizing the poem’s feeling of temporary assemblage. 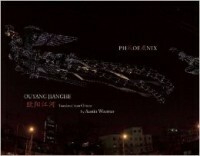 In addition to the side-by-side Chinese and English, many of the book’s spreads also include full-color photographs of the poem’s inspiration: the artist Xu Bing’s Phoenix, a sculpture of two twelve-ton phoenixes made out of hard hats, saw blades, shovel heads, and other discarded construction materials. Readers can therefore sift through the relationships among sculpture, ekphrasis, and translation. With these two languages and photographs, Zephyr Press and MCCM Creations have produced a gorgeous book that encourages multiple readings. Tim Lantz’s most recent essay is forthcoming from The Legendary. He lives in Lawrence, Kansas, where he is the nonfiction editor for Beecher’s. His website is timlantz.com.